Washington D.C. is every American's home away from home. Since DC is a compact city with great public transportation, it's easy to explore both its high-profile side - its magnificent monuments, world-class museums, enthralling architecture, breathtaking vistas, and unique national parks - as well as its less famous persona - its cozy hideaways, ethnic eateries, bustling dance clubs, lively theaters, shopaholic hot spots, and more.Now it's a foodies' paradise enlivened with high-tech entrepreneurs and innovative buildings in entirely new and safer neighborhoods. 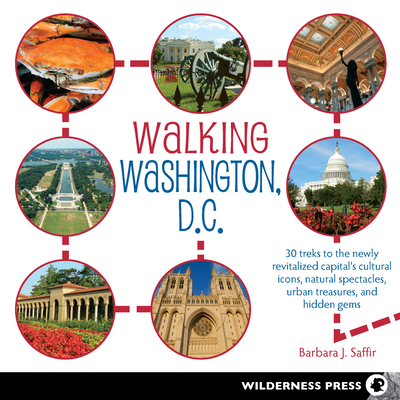 Now, with Walking Washington D.C by local author Barbara J. Saffir, people can get to know the communities of D.C. Each walk tells the story of a neighborhood: a snapshot of some of its history and how it has transformed over the years. Readers will be pointed to distinctive architecture, landmark buildings, popular eateries, ethnic enclaves, art and performance spaces, and natural scenery. Maps and transportation directions make it easy to find your way. Whether you're looking for an afternoon stroll or a daylong outing, grab this book and start walking Washington D.C. After a few miles or a few days, you might fall in love. Barbara J. Saffir has been exploring DC's urban treasures and its softer side for the "Washington Post," other publications, and herself for three decades. As a former reporter, political researcher, architecture critic, and nature photographer, she has always adored sharing adventures and discoveries that make people say, "Wow!" She lives in McLean, VA.